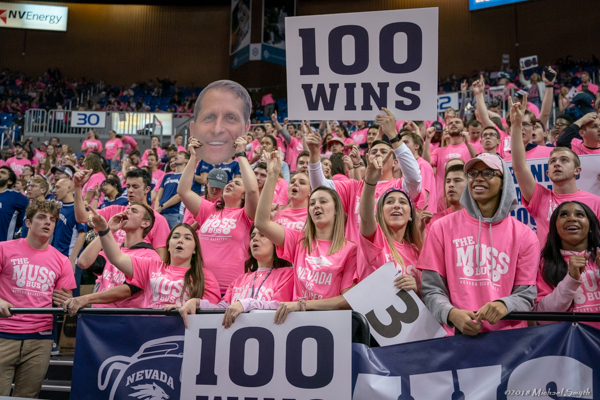 The Muss Bus at Reno’s Lawlor Events Center celebrate Nevada coach Eric Musselman’s 100th win on Wednesday. 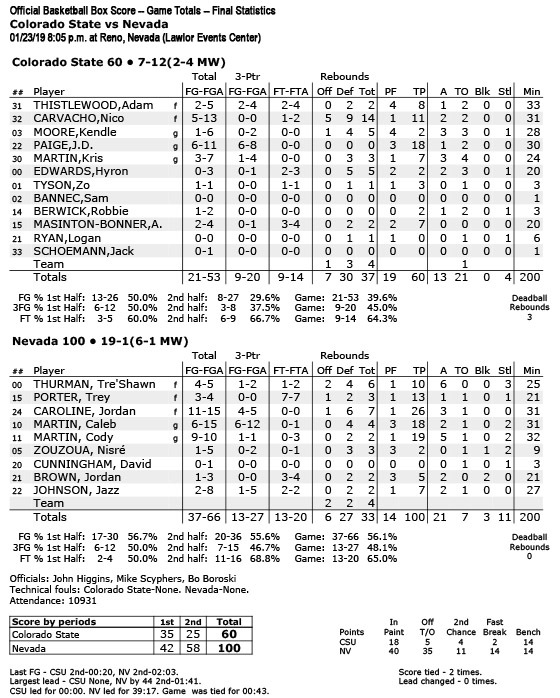 The seventh-ranked Wolf Pack defeated Colorado State 100-60 to improve to 19-1. 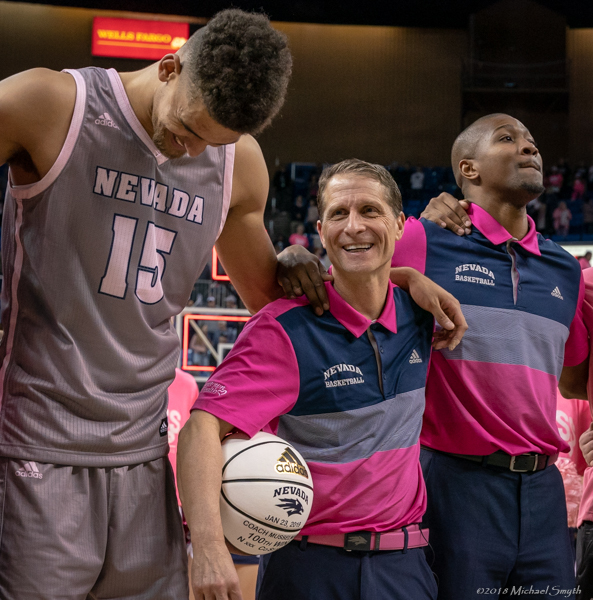 For the seventh-ranked Nevada men’s basketball team, it’s only fitting it scored 100 points to celebrate coach Eric Musselman’s 100th career victory in his four-year tenure. 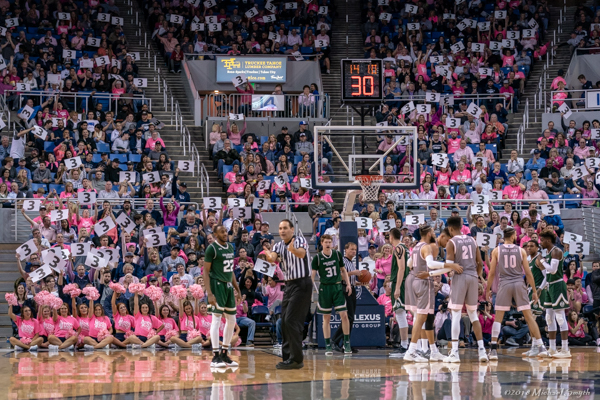 Jordan Brown’s free-throw with 35 seconds remaining did just that to top-off a 100-60 rout over Colorado State on Pink Night at Lawlor Events Center. Musselman is the sixth coach in school history and 25th fastest in the NCAA to record 100 wins in the silver and blue. The Wolf Pack improved to 19-1 and 6-1 in the Mountain West Conference. Nevada moved up three spots on the AP Top-25 Poll on Monday. 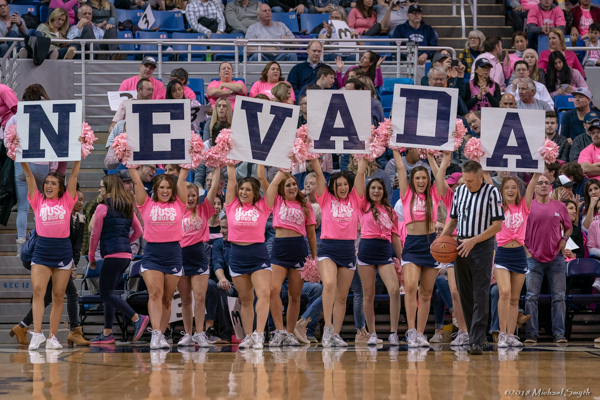 Nevada also debuted its “Pink Out” uniforms with a gray primary and a light pink trim, joining 10,931 fans in dressed in pink-themed T-shirts to support breast cancer awareness. The Wolf Pack looked pretty in pink, especially offensively. 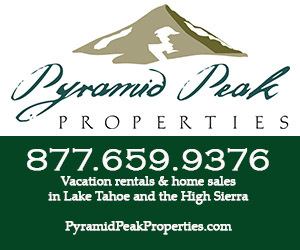 It shot a blistering 56.7 percent from the floor and 48 percent from 3-point territory. There were 21 assists. Caleb Martin ended his shooting slump with 18 points on six of 12 shooting from behind the arc. Martin’s signature, jab-step 3-point shot was clicking on all cylinders but he also showcased a quick one-two crossover to drive into the paint and score easy layups off the backboard. Martin battled flu-like symptoms before the Air Force game Saturday held to 10 points on four-of-15 shooting. Per usual, Jordan Caroline scored a game-high 26 points on an efficient 11-of-15 shooting, including four of five from beyond the arc. While Caroline battles for his points down low, he displayed his three-point range via the catch-and-shoot and off the dribble. Caroline has been putting in the extra work on his shot, and it’s paying dividends toward his draft stock come June. 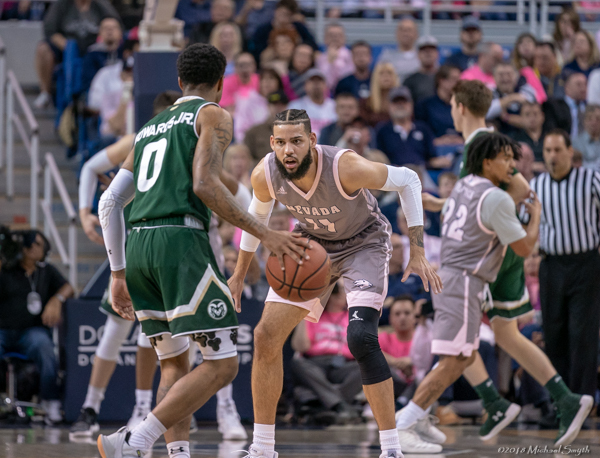 Cody Martin added 19 points and five assists in assertive fashion, hitting mid-range jump shots and turning on-ball steals to thunderous slams in the open court. Martin leads the Mountain West with 5.3 assists per game and is taking the lead-role of the Wolf Pack offense. Brown totaled five points and two rebounds in 21 minutes off the bench after just a seven-minute outing against Air Force. Going away from the conventional small-ball approach Mussleman played both Brown and center Trey Porter on the court. Their combined efforts kept Nico Carvacho, the nation’s leading rebounder, at 12.3 per game off the glass and sealed the game up in the early stages of the second half. “We wanted both of those guys to throw in on Carvacho and both of them did a great job of switching and bothering him all night,” Musselman said. Defensively, the Wolf Pack limited the inside presence of Rams, forcing them to their offense from the perimeter. The game plan worked to perfection, CSU shot 39 percent and forced 21 turnovers, which fueled several transition buckets for the Pack. Carvacho finished with 11 points and 14 rebounds. 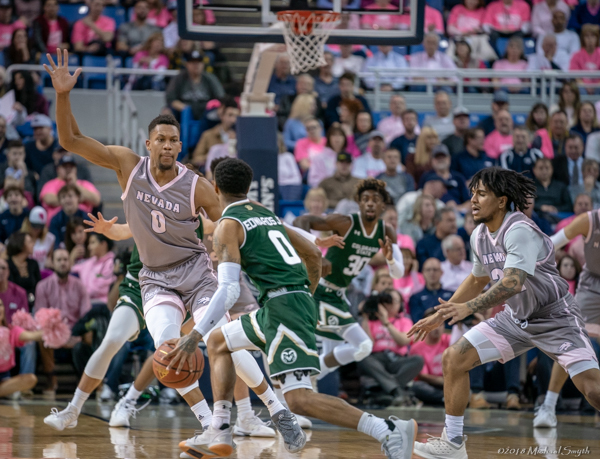 Senior forward Tre’Shawn Thurman was re-inserted back into the Wolf Pack starting lineup after senior Corey Henson was ruled out for the game with an undisclosed illness. Thurman joined join the regular cadre of Porter, Caroline and the Martin twins. 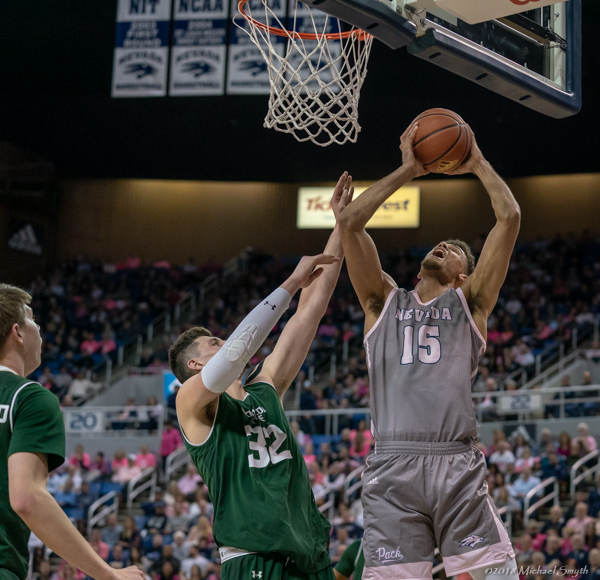 Nevada brushed off its first-half offensive woes after a 20-point first half against Air Force Saturday, the lowest in the Musselman era. 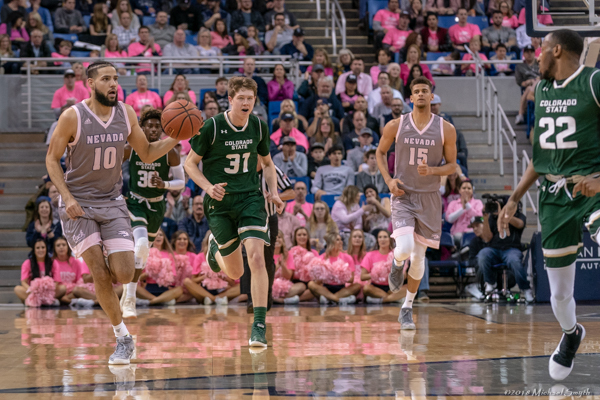 The Wolf Pack responded with a season-high 50 percent shooting on Wednesday in the first 20 minutes of action and started six of seven from the field. 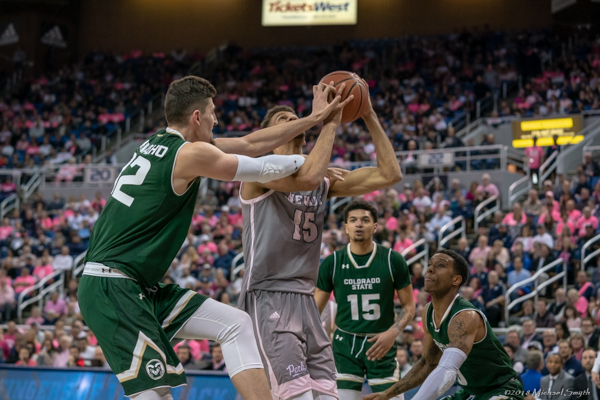 Colorado State, 7-12 and 2-4 in the Mountain West, went to a zone defense and clawed its way back into the game with back-to-back threes to kick start a 8-4 run. The Pack led 42-35 at the half. 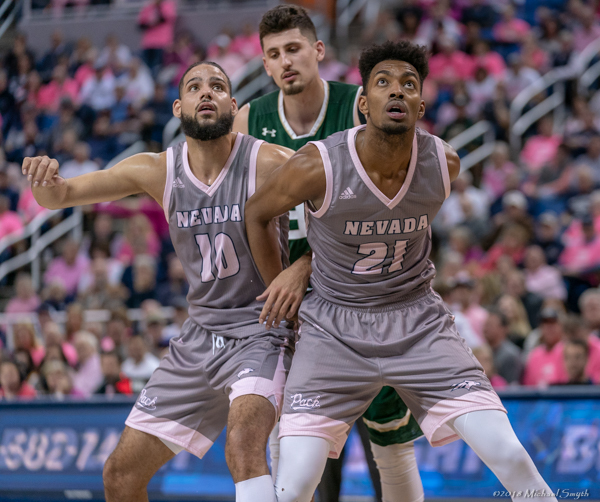 Nevada poured it on in the second half outscoring the Rams 58-25 with stingy defense, crisp offense and Sports Center-worthy dunks. The double-digit lead hit the 30s with under 10 minutes left to play and reserves were put in place to close the game out. Nisré Zouzoua tallied two steals in nine minutes. 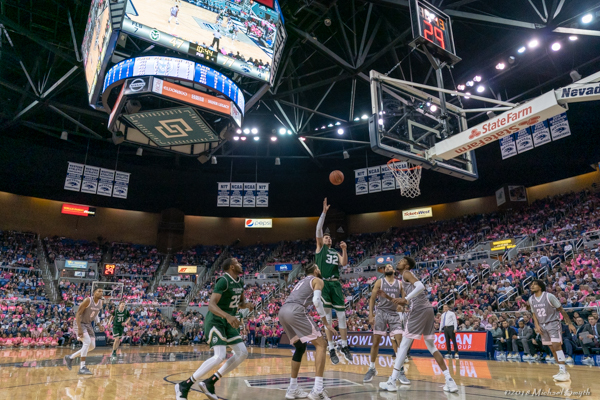 The Wolf Pack face the UNLV Rebels in a road game Tuesday, Jan. 29, at the Thomas and Mack Center. The Rebels are 11-7 overall and 5-1 in conference this season. Notes: The Wolf Pack lead the Mountain West in 3-point attempts (521). … Jazz Johnson is second in the Mountain West in 3-point field goal percentage at 45.7 percent (42 of 92). 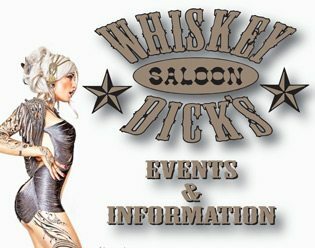 ,,. 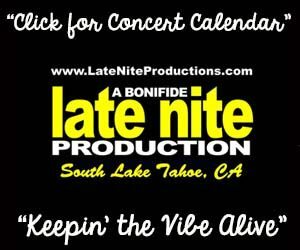 Nevada is 53-2 at Lawlor Events Center under Eric Musselman. … Nevada’s 19-1 record is the best in school history after 20 games. From left, Trey Porter, Eric Musselman and Armon Johnson celebrate after the coach’s 100th victory. Caleb Martin and Jordan Brown box out the nation’s leading rebounder, Nico Carvacho.